There is so much to love about traditional Waldorf dolls. These gentle-featured handmade toys are typically sewn from cotton tricot fabric and stuffed with pure wool roving or batting, their faces shaped by strong binding threads to form the classic chubby-cheeked baby profile. I’ve been making these dolls for several years now, and each is truly one of a kind; when you invest hours on the many processes required to make and clothe one, you do develop a connection with it. Creating a natural toy to be loved and enjoyed is a bit like knitting a child’s sweater, in that you hope and imagine it will become a comforting part of someone’s childhood. 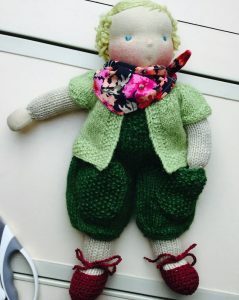 My latest dolls combine knitted bodies with cotton jersey faces and hands; their clothes are all hand knit, crocheted or sewn, their faces hand-embroidered and a natural beeswax flush added to their cheeks. If you would like to buy one of my dolls please check my shop for new additions.